How Does Natural Language Search Help Me Find IT Devices in the Data Center? By using NodeGrid Serial Consoles in standalone or cluster configuration, it’s easy to find physical servers, routers and switches, storage and power devices – with one search bar and five different views for all your serial console devices. Viewing options include table, tree, node, geo map and web search result views. When connected together, it’s easy to search across clusters of NodeGrid Serial Console serial ports. Log into one NSC server to quickly find and access devices plugged into any other NSC server. This is also true for standalone NSC servers. The NodeGrid platform is dynamically in sync with your environment. Newly added devices are automatically discovered, indexed and immediately available to the rest of your centralized console management nodes and authorized users. 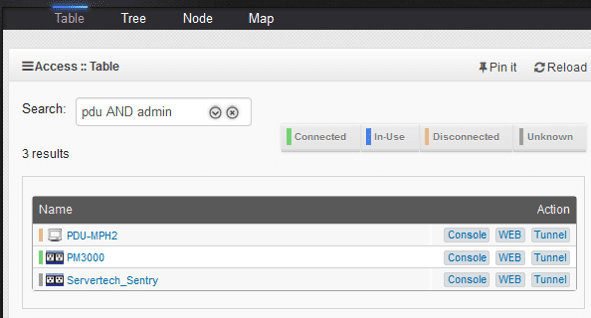 Users can add searchable custom fields and data to any serial device attached to NodeGrid Serial Console. 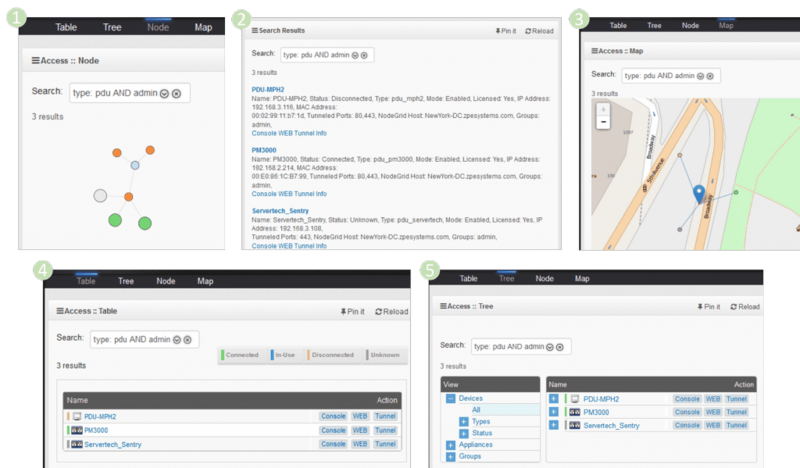 NodeGrid’s search engine displays real-time device results on the fly, based on all standard and custom fields. All of your organization’s data center devices are quickly and easily searchable by anyone logging into the NodeGrid platform. Search results are automatically saved into your search bar history for later reference. In addition, you can “pin” your favorite default view and each time you return to the Access main screen, you’ll see your devices in the preferred view. Using keyword search and complex logic (AND, OR, NOT, and more) you can find IT equipment based on single or multiple device properties. You can search for “Groups: admin AND status: connected” to find all devices which belong to the admin group AND are connected (on and reachable). Unless you never plugged them in in the first place, there’s no way you won’t be able to find your devices with our five views and web search capability. We all have different ways of doing things, and so our product reflects this and helps your team members perform at their best. Every device view and search result view includes all buttons you need to immediately access device information, the console, secure tunnel or native web portal. No need to have two browser windows open, or click back to get to a control panel for the device you’ve just found. Because NSC crawls and re-indexes its database periodically, users quickly find new and modified devices practically on demand. Because clustered NSCs only share the index of your device pools, there is minimal CPU load on your clustered NSCs. There is also reduced network load. Everyone knows how to use search engines and graphical dashboards. Why not search for data center assets the same way and save time doing so? Time is money. There’s no more need to use spreadsheets or dig through inane levels of organizational trees to track devices. Find out how NodeGrid Serial Console’s Yocto and Docker container capabilities benefit IT managers and users. Have questions or want to evaluate a NodeGrid Serial Console unit for your lab environment? Contact us, we’re here to help. Share the post "5 Ways to Find Data Center Devices Using NodeGrid Serial Console"